Letters of Note: Together we can "BEAT IT"! Together we can "BEAT IT"! I'm suffering miserably from a bout of man-flu at the moment. 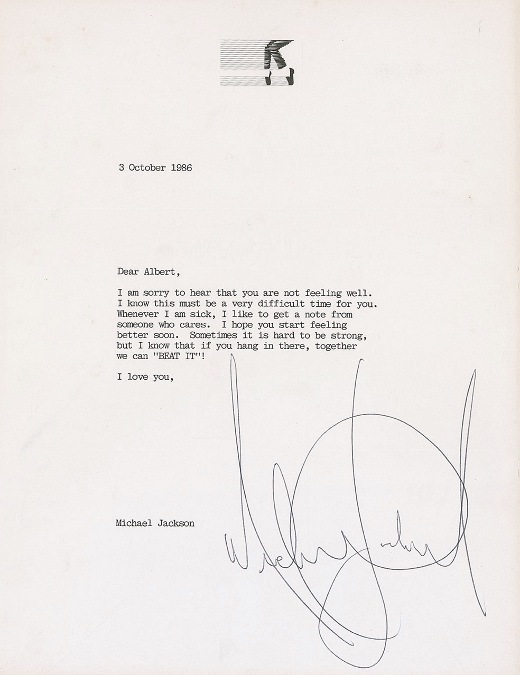 As a tribute to its seemingly monstrous grip - and due in no small part to the fact that very little research is required when writing the introduction - I bring you a brief but endearing 'get well soon' letter, written by Michael Jackson in 1986 to a friend named Albert who at the time was in ill-health. Notable if only for the perfect letterhead. Transcript follows. Image courtesy of RR Auctions. I am sorry to hear that you are not feeling well. I know this must be a very difficult time for you. Whenever I am sick, I like to get a note from someone who cares. I hope you start feeling better soon. Sometimes it is hard to be strong, but I know that if you hang in there, together we can "BEAT IT"!